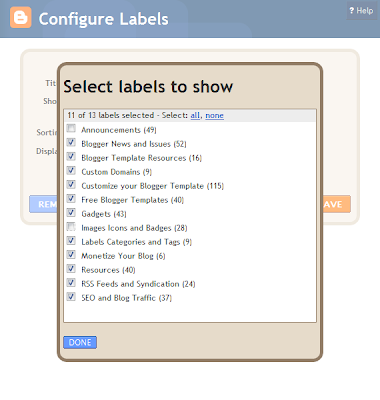 Blogger Buster: Improved Label Gadgets - Now Supporting Label Clouds and More! Improved Label Gadgets - Now Supporting Label Clouds and More! As part of Blogger's 10th Birthday celebrations, the Blogger team have been hard at work developing enhancements and new features. In the "Display" options, choose "Cloud", then save your new gadget. 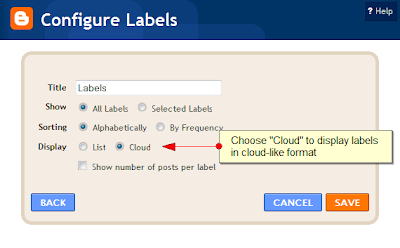 Now when you view your blog, you'll see your labels display in cloud-like formation, with more popular labels highlighted in larger text. By default, the labels will be styled to fit with other elements in the same section. All labels will appear in the same color as other links in this area and size is determined by the popularity of the label, on a scale of 1-5 (where 5 is the most popular). I'll write up a full tutorial in the next couple of days explaining in more detail how the labels may be customized to your particular preferences. In the meantime, I hope these class examples will help those familiar with CSS to begin styling their own label clouds. The second improvement to the Labels gadget is the ability to choose which labels are displayed in the gadget. This is an ideal solution for those who use many different labels in their blog, and find the long display or confusing navigation difficult to deal with. To select which labels you would like to display in your gadget, add (or edit) a Labels gadget, and choose "Selected Labels". One feature which I like best about this enhancement is that we can choose to use more than one Label gadget to differentiate between "Categories" and "Labels" - at least in the sidebar gadgets! For example, we could title one label gadget as "Categories", and choose to display only a handful of descriptive, "category" labels as a list. 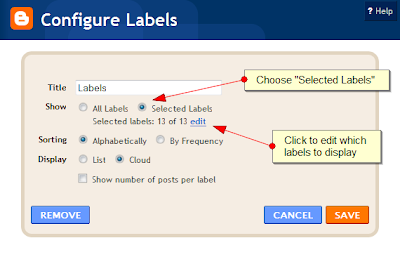 Next, we could add a second label gadget named "Tags" which displays as a label cloud and shows all tags used in the blog. Of course, this does not yet perform the same differentiation for posts as true "categories" would, but it is a good start and enhances usability for our blog readers. 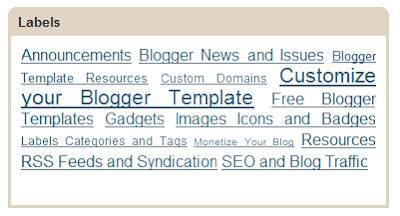 Overall, I am very impressed with these enhancements to the Blogger Labels gadget as they enable us to customize the navigation experience for our readers. I'm sure the Blogger team have even more great features and enhancements to roll out as part of Blogger's 10th birthday celebrations and look forward to reporting and explaining more about these in the coming weeks. Feel free to let us know your own opinions and experiences of these enhancements by leaving your comments below.